The warship was launched and named back in December 2013, but the Navy just took delivery of it and the excited seamen have been putting their new toy through its paces. Before heading for its homeport in San Diego, the ship is undergoing acceptance tests - which see the maritime marvel travel at top speed. 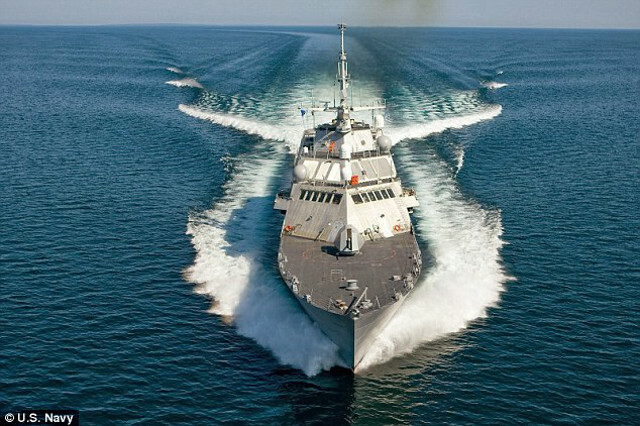 The USS Milwaukee can power up to 45 knots (52 mph), which leaves others ships floundering in her wake. The combat ship will be commissioned in three weeks' time on Saturday, November 21. The USS Milwaukee is part of a new breed of U.S. Navy combat ships designed for littoral, or coastal, missions. This transfer of authority from manufacturer Lockheed Martin to the U.S. military marks the final milestone before the ship is formally commissioned. Littoral combat ships are comparatively small surface vessels fitted for naval combat close to shore.